Okay, I guess we haven’t just learnt this. We’ve known this for some time now. He makes the same mistakes time and time again. The faith in Ghana’s hopeless goalkeeper Fatau Dauda, who was responsible for the concession of Uganda’s goal. The use of a poacher, Abdul Majeed Waris, as a second striker. While these are positional problems Kwesi Appiah is still unable to adjust his teams to any problems faced. Uganda defended in two narrow banks of four and sat deep, the way everybody knew they would. Everybody except Appiah. He set the team up with Christian Atsu and Andre Ayew playing as interior midfielders in a 4-2-2-2 but no width came from the full-backs, making it easy for Uganda to defend against. Kwesi Appiah had no idea of how to solve the puzzle put in front of him. Ayew was finding space well in the middle but Atsu was not. He easily could have played Ayew as a number 10, put Atsu on the left to provide some width, and bring Wakaso Mubarak on for Waris to play on the right hand side. This would have allowed the side to pull the Ugandans out of shape and create some chances. A man with confidence in his ability would probably mention that he thinks he’s good enough for the job and that’s why he’s staying. Senegal’s injuries – a blessing in disguise? Putting on one of their better performances of recent times, Senegal’s 2-0 victory over Egypt demonstrated what a balanced, all-round team they are capable of being when they wish to be, as a home performance against one of the strongest opponent in their group got the people of Dakar excited. In front of a raving crowd in the capital, Alain Giresse was forced to leave out a number of star names from the starting line-up through injury, as they sought to go for overall team quality rather than stuffing as many star names into the XI as possible. With Demba Ba and Papiss Cisse missing out through injury, and Moussa Sow remaining on the bench, they went with a frontline of Sadio Mane and Dame N’Doye flanking Mame Biram Diouf, and ended up with a wonderfully flowing front-three that destroyed the rickety Egyptian defence. Whilst in the past Giresse has gone for a front-three of Ba, Cisse and Sow – one that is quite unbalanced and resulted in lack of coverage for the midfield behind them – the injuries to key players permitted him to try something new. With Mane and Diouf on the ascendancy after moving clubs this summer, and Dame N’Doye thriving in a free-type role between the wing and number 10 positions, the return of Ba and Co may give the manager a bit of a headache as to what side he puts out. It’s easy to imagine what would have unfolded if Ivory Coast had gone into half time trailing, as they did against Sierra Leone on Saturday evening, with Didier Drogba still lurking on the sidelines. Wilfried Bony may have probably started the game, but Drogba on the bench would have been seen as the saviour. And had Lacina Traore been fit, the path would have been congested yet again for Seydou Doumbia. A record of two goals in 20 caps before Saturday doesn’t tell the whole story, for much of those caps have come from spurts off the bench. And although his back injuries were cited as the reason for his exclusion from the World Cup squad, his record undoubtedly played a part in Sabri Lamouchi’s composition. Even had Doumbia been on the plane to Brazil, it would have been difficult envisaging him gaining much game time. But with Drogba now gone, things have changed for the better. Salomon Kalou was at his misfiring and anonymous best in the first half. And so it was Doumbia, waiting next in the queue, who was summoned for the second half. In a lively cameo, he cherished the high pressure conditions and strived to banish the agonising pain of being cut from the provisional World Cup squad. He scored the equaliser and the devious, rascal movement which has made him one of Europe’s most remorseless strikers in recent years was on display – at one point turning onto a lofted throw into the box in the blink of an eye, his shot away striking the post. Drogba’s aura and influence is irreplaceable, but in Doumbia Les Elephants have a man ready and willing to embrace the goalscoring workload, and the ceaseless movement which helps to fluster compact defences. A formation made famous during their three consecutive AFCON wins, Egyptian football does not seemed to have engrained the formation into their current crop of players, as the ghastly representation of the formation that proved so successful categorically flopped against Senegal, as it played right into the hands of their opponents. Gone are the days of Wael Gomaa and Abdel-Zaher El-Saqqa, as the back three of Okka, Ali Ghazal and Shawky El-Said proved highly inappropriate replacements for their successful forefathers, as manager Shawky Garib failed to repeat the trick of legend Hasan Shehata this weekend. Poorly organized and highly immobile, Dame N’Doye was allowed to thrive just behind Mame Biram Diouf, as he threaded balls through not-so-small gaps throughout the game to pick up two assists. With Saido Mane and Diouf easily outpacing the opposition defenders, one would question why the younger, speedier Ahmed Hegazy and Ramy Rabia weren’t used at the back to give chase to the Senegalese forwards. Admittedly, the wing-backs of Ahmed Elmohamedy and Ahmed Fathi rarely helped out, it seems unwise to persist with this formation given the lack of players appropriate to play in it, even though it is worth praising the manager’s keenness to be consistent. 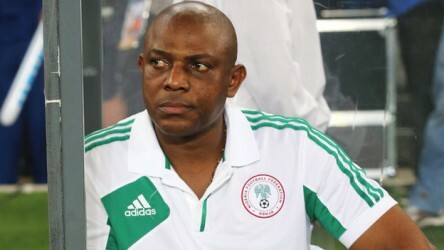 Off-the-field problems had dominated the run up to the match, and many will point to those distractions as partly responsible for the shock 3-1 loss to Congo, the first in a competitive home game since 1981, but Keshi has to take some responsibility for failing to control the variable that is in his hands: the team selection. He omitted chief striker Emmanuel Emenike from the starting XI, reportedly because Fenerbahce striker reported late to camp. It’s a misdemeanor, but hardly one that warrants a reprimand. You see, Emenike is not easy replaceable. The Super Eagles don’t have anyone else in the current set up with that businesslike bustle to lead the line so manfully. Losing one their talisman and all-time top scorer, the Indomitable Lions turned a negative into a positive in the game against DR Congo, with the response that they made to this news very admirable and boding well for the future. With manager Volker Finke well-and-truly revamping the side that crashed out of Brazil as the official last-placed losers, he and the FA undertook a considerable cull of players, as some big names lost out and some new faces were brought in. Indeed, whilst by no-means a perfect performance, they appeared a team that were freer and devoid of the control that their former captain had over the team simply by being there, and once again enjoying their football. A slightly stodgy, uneventful game, the positive signs could be seen in the way both the new men and survivors from the old plan combined. Lyon forward Clinton N’Jie scored on debut, with a nicely poked-in finish, whilst Jerome Guihota and Ambroise Oyongo both had solid first games as well, and Vincent Aboubakar played magnificently in his new-role as vice-captain – picking up a goal in the game as well. The next game against Ivory Coast will tell us whether this is form that will be continued, but the signs are there for Cameroon that this could be potentially a positive new dawn, as they emerge from doldrums. Its good Appiah used 2 strikers because that is the first mode of unsettling deep defences. You are right in that he should have pushed his fullbacks to join attacks, criminal he didn’t since he has Afful. Also in a 4-2-2-2, one of the two mids (Atsu) has the responsibilty of being a little wider/direct. Egypt’s 3-5-2 used to work because of the sweeper but now it is simply 3 men rooted at the back. This leaves the wings “under-resourced” and the midfield also. If a team is playing 4-3-3 (senegal) then they can take on the 3 man-marking defence style with their 3 attackers. Egypt also seemed unable to carry out their counter-attacking plan; especially since they only had one player to move the ball with pace.